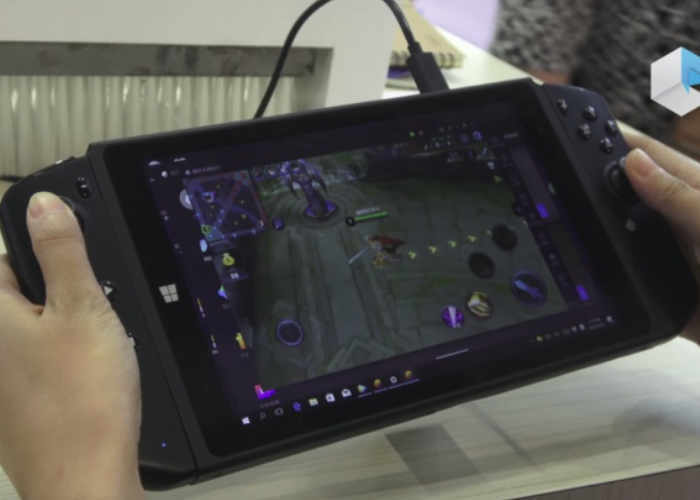 The new prototype device has been demonstrated to the team at Notebook Italia this week which combines features from both are handheld Nintendo switch console and Windows tablet to create a unique system called the Vastking G800. The handheld gaming device is equipped with an 8 inch full HD screen and powered by an Intel Apollo Lake processor supported by up to 6GB of RAM. Watch the video below for an introduction to the Vastking G800 handheld game system. Internally the Vastking G800 is equipped with an Intel Pentium N4200 quad-core Apollo Lake processor capable of running Microsoft’s latest Windows 10 operating system and the 8 inch IPS display offers users a resolution of 1920 x 1200 pixels. Storage takes the form of 32 GB of internal disk space which can be expanded even by installing a solid state drive (SSD). Other features include connectivity via 802.11b/g/n WiFi and Bluetooth. Together with ports for USB Type-C, USB 3.0, micro HDMI port, and a handy two-megapixel front facing camera all powered by an internal rechargeable 7.6V 3,400 mAh battery that is capable of powering the device for up to 4 hours from a single charge. Unfortunately, no information on worldwide availability has been released as yet by Vastking, but the Vastking G800 is expected to be priced around $300 to wholesalers purchasing a thousand or more units at a time. As soon as information comes to light, we will keep you updated as always.